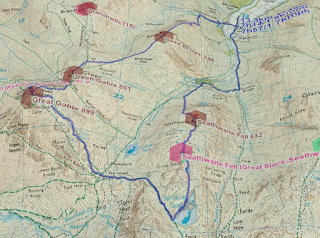 Rather than the original plan for Great Gable, which was to park at Gatesgarth Farm and take the path between Fleetwith Pike and Haystacks, we opted to drive up to Seathwaite and try our luck at the on road parking. Now this was with a small bit of regret, since my only childhood memory of walking hills in the lakes was doing Haystacks with my Dad, and complaining bitterly on the long slow descent down this path. So I was slightly looking forward to having a similar experience with my kids! 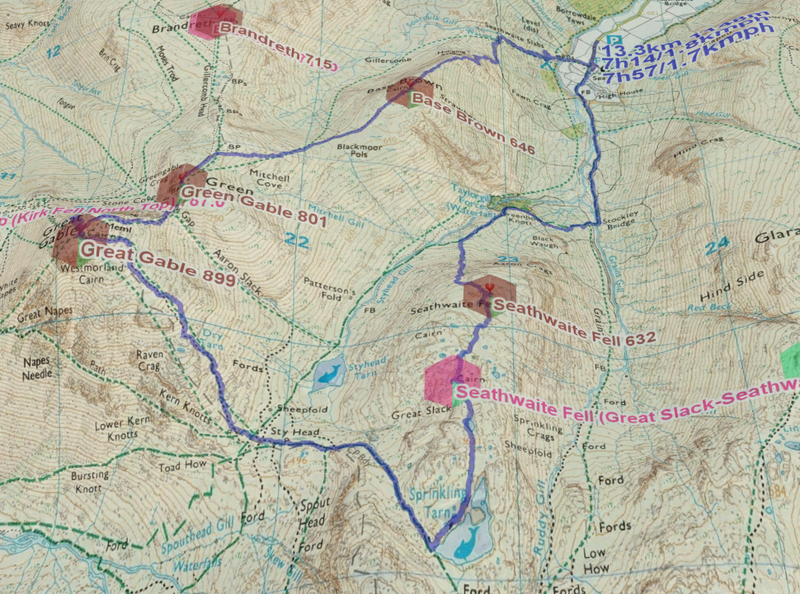 Still, some route planning the evening before made this option look a little shorted and added the ability to pick up two extra peaks, Seathwaite Fell and Base Brown. 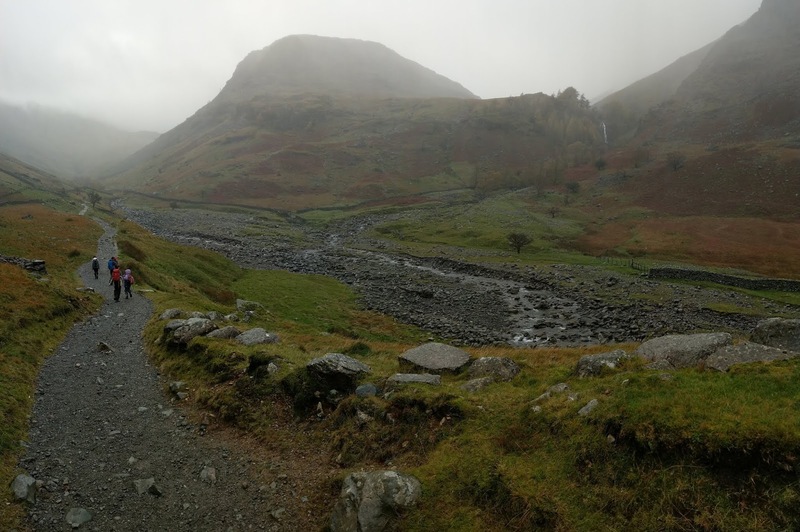 We drove to Seathwaite, and managed to park within a dozen cars from the end of the road. Maybe this was something to do with the overcast skies and forecasts of rain. We took the path going to Stockley Bridge, seen here on the far left of this picture, before crossing right in front of Seathwaite Fell, here in the centre. 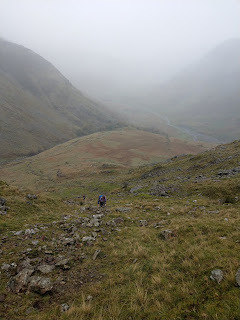 Climbing up Seathwaite Fell, you got the sense that this was the last we would see of the valley floor for a while. 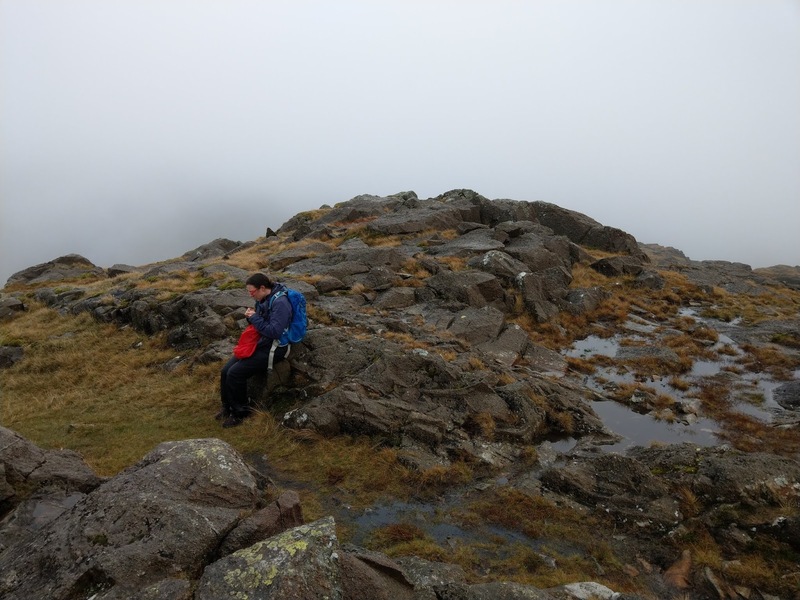 Seathwaite Fell, the Wainwright - clearly picked over the higher Hewitt point due to the awesome views from this location. Did I mention that it was raining? 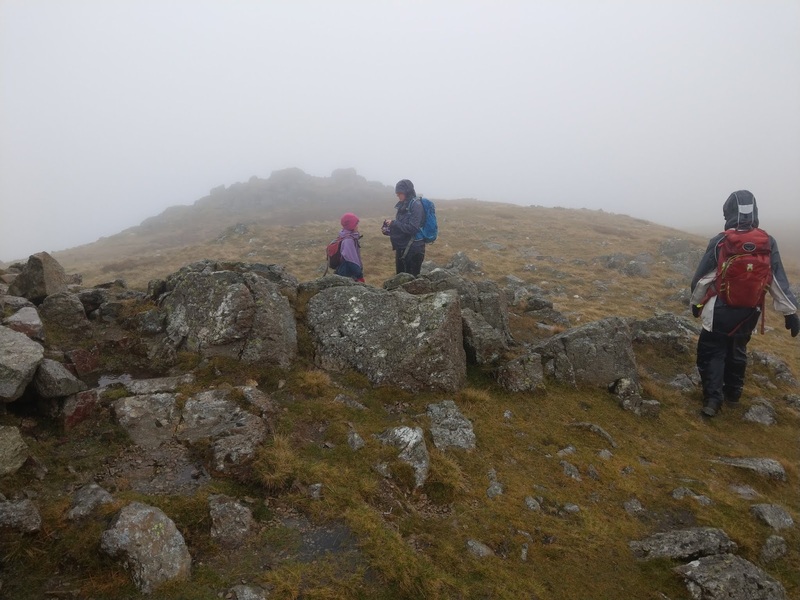 The really good thing was that everyone was engaged with the walk and loving the conditions! 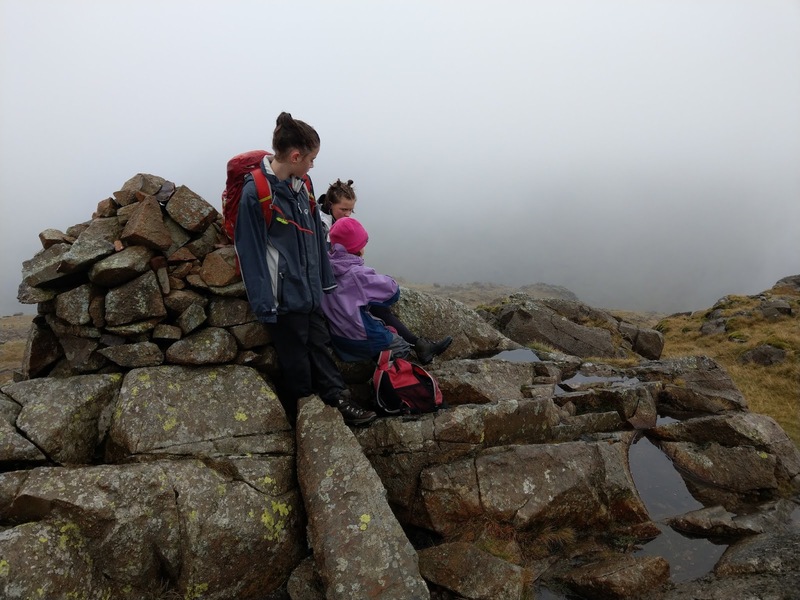 Grace, very excited to be at the Hewitt point for Seathwaite Fell. You can really see what extra view those extra 31m of height gets you, compared to the Wainwright view. And so we went down past Sprinkling Tarn (which was huge), Sty Head (which was fairly deserted), and up the long climb to Great Gable. I'm not sure whether it helps when you can't see the top - less chance to get disheartened at the climb to come, less chance to get excited about getting to the top. 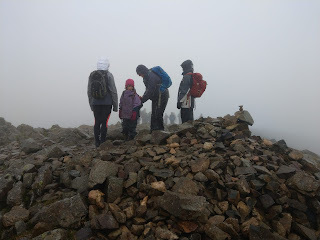 Still, with Evie dragging her heels (despite having finished her second packet of crisps), we finally made it. Coming off the top we started down the wrong path, tried to cut across to the right path, found a nice looking cliff edge, so retraced our steps and found the right path. 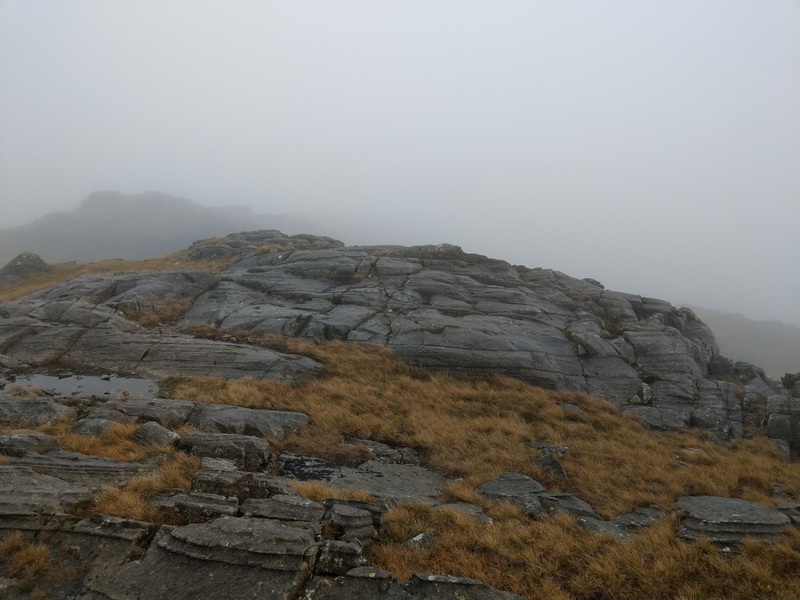 Again, zero visibility and a nice flattish top that looks identical from all directions makes navigation quite interesting. We came down and across to Green Gable, which was noticeably more green (apart from right at the top). 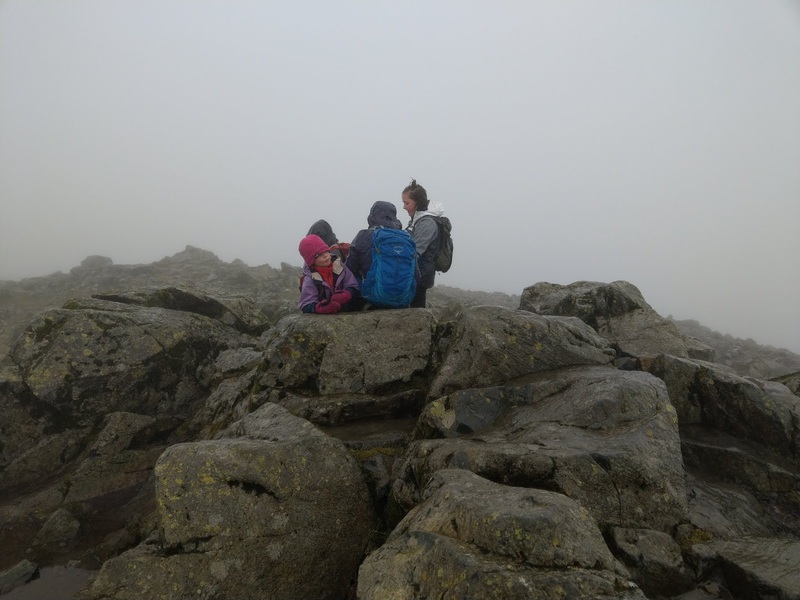 There was a large group of people there, clearly on a similar walk, and we shared stories of how much better the view was from Great Gable. From here we walked along the ridge to Base Brown. Again, we somehow couldn't see the impressive views that Wainwright sought, but never mind. Just another excuse to need to come back here in better weather. 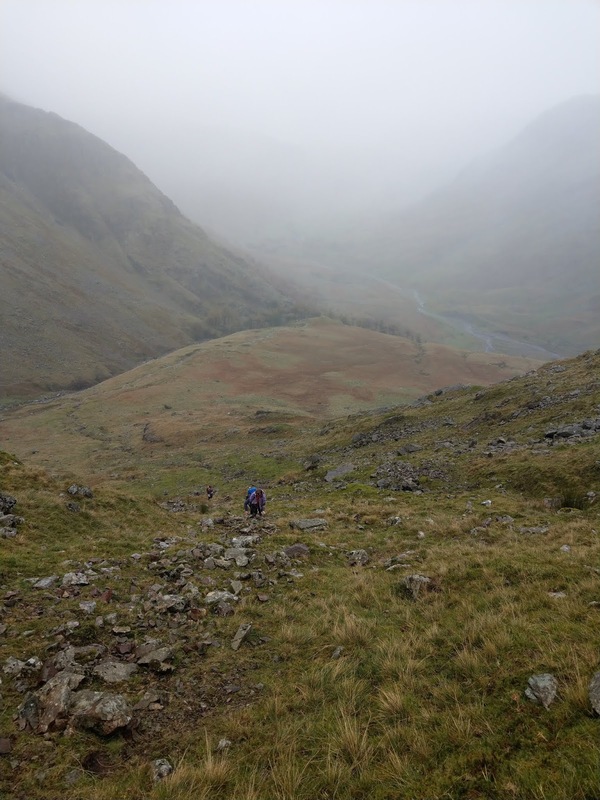 We now took the direct route down to Seathwaite, which turned out not to be the wise choice. 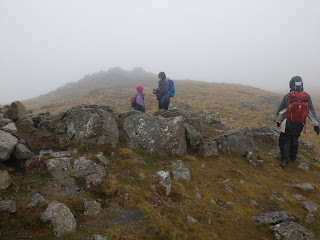 It was very steep, very slippery, consequently very slow going. 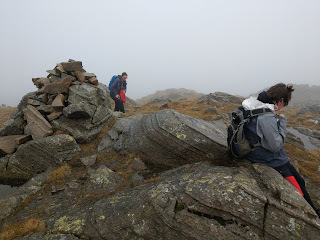 Even when we were on the main path, the route next to Sourmilk Gill was huge slabs of rock that were treacherous. The light levels were falling, but we managed to get off the slopes before we needed to resort to our torches. It's finishes like this that make me happy that we typically allow quite a bit of safety margin when thinking what time we need to finish.